Leaves: Two forms, 2 to 20 inches long, once-pinnate, linear to narrowly oblanceolate in outline, base gradually tapered, tip pointed to nearly blunt; stalk purplish-brown to reddish-brown, stiff, shiny, glabrous, .4 to 4 inches long; sterile leaves 2 to 6 inches long, primary divisions (pinnae) up to 20 pairs, division segments short, 1/3 to 2/5 inch long, 1/8 to 1/4 inch wide, tips blunt; fertile leaves taller, more erect, to 20 inches, primary divisions up to 50 pairs; pairs mostly alternate; primary division segments oblong to quadrangular, 1/6 to 1.4 inches long, to 1/4 inch wide, smooth, leathery, veins conspicuous; margins nearly entire to narrowly or deeply toothed; tip pointed to blunt; base broader; auricles at base overlap rachis; sori elongated, borne on back of division segments, nearer mid-vein than margins; indusium attached along edge of sori. Habitat: Shaded moist areas, woods, on rocks or wooded sandy banks and slopes, thickets, rocky ledges, hillsides; gravelly, slightly acidic, well-drained soils. Comments: Drought tolerant. Not aggressive. 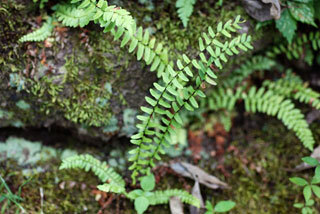 Ebony spleenwort is the only North American fern occurring in South Africa. The common name ebony alludes to the dark leaf stalks.